How we present data is hugely important and all too often I think the geeks don’t think enough about the message and graphics to help humans understand the data, not just read the numbers. And of course bad presentation choices can be deliberate to make a point. The right question is very important and here’s what I think it the right question: ¿Do we elect a president by population or acres? I know, it seems stupid, but doesn’t the tagline with the mailing raise that question? I believe we should approach it not by acres but by people (yes I know, the Electoral College (and 2000 Bush vs Gore decision where it came down to 5 justices to 4) distort this some). 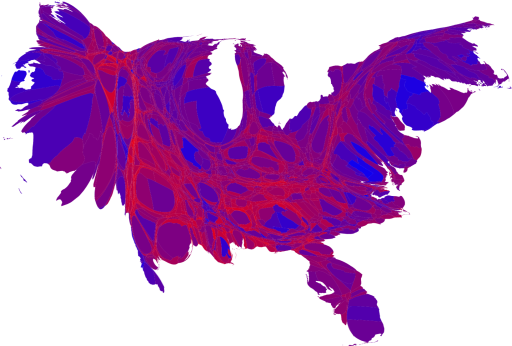 If you check out Maps of the 2008 Presidential Election Results (2012 results don’t seem to be complete yet) you can see many variations. My favorite follows. Rather than two colors which overemphasizes differences they use a more graduated scale. 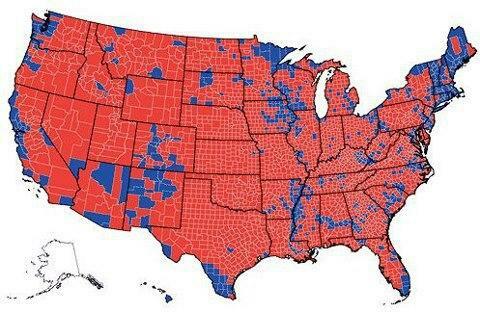 And they distort the map so that equal populations take equal areas. Doesn’t look so dramatically out of line does it? And of course this is a Homer Simpson “D’OH!” moment. The 2008 election split 53% to 46% so it should be pretty evenly split. You say: But the implication was about Makers and Takers. What about that?!?! Good point. A number of Republicans and conservatives are on TV and radio saying the election is a tipping point where the takers are now in control. Let’s look at that with a quick back of the envelope analysis (I’m busy and don’t have time for a lot of work right now on this). I like “peer reviewed” information, since it works out many errors in data, so of course I went to Wikipedia to find Federal taxation and spending by state. Analyzing this I found the numbers don’t add up, so now (dang it) I feel an obligation to go in and correct it someday. I went and looked for original data but found the federal site closed down because the department was closed (budget cuts?). So I found the Tax Foundation had 2005 data (their most recent) adjusted to be “deficit neutral”. Wikipedia tells us this is non-partisan but some claim are conservative and pro-business leaning. Sounds good! How much are the blue states taking for every dollar they give the federal government? They get back $0.99, so they’ve generously been loosing 1¢ for every dollar in taxes. And the red states? They’re taking $1.37 for every dollar in taxes they paid, making 37¢ for every dollar they pay. Let me be clear: the Red States get a lot more than they pay for, some would call them “takers” or “moochers”. The Blue States essentially pay for what they get. The NYT’s got a good look at what this looks like on the ground. Check out the New York Times February 12, 2012 article “Even Critics of Safety Net Increasingly Depend On It“.